In education there is a constant struggle between quality and quantity of information. As an educator, you have limited classroom time in which to instruct your students, but a great deal of subject matter to cover. As a student, you try to optimize your study habits to absorb what you need to know for your next exam, without overloading yourself with less-relevant information. This same tenuous balance also exists in the creation of educational resources. 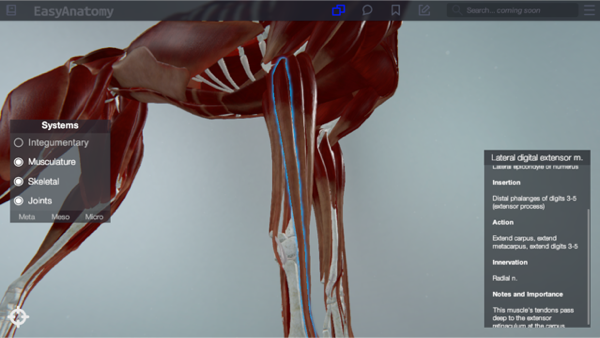 In this post, our team of anatomists: Dr. Terri Clark, Dr. Susan Dawson and Dr. Corinna Klupiec, share how they’re aiming to keep EasyAnatomy’s explanatory written content focused on what students most need to know, and the information most relevant to their future profession. 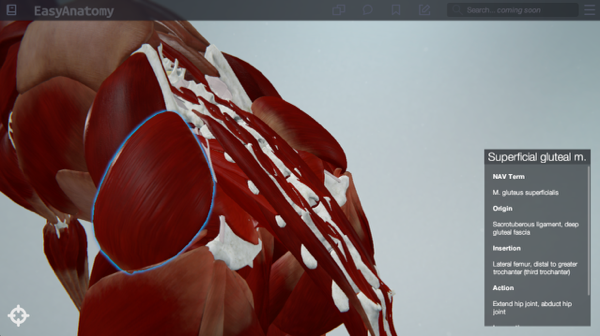 How did the anatomist team decide on the overall strategy behind EasyAnatomy’s Written Content? Dr. Klupiec: With EasyAnatomy’s written content our idea is to provide shorter summaries of the very detailed content you would typically find in textbooks. We aim to hone in on the really salient features, particularly those that are demonstrable in the app. Dr. Dawson: Our philosophy has been to make EasyAnatomy a comprehensive resource that focuses on what students need to know. We explain not only the “what” of anatomic structures, but also “why” they are important. Dr. Clark: The challenge for us when writing the content is finding the right balance. We want to focus on what will be most useful and relevant during their studies, but we also want to include enough information to ensure the app is a helpful reference resource for students. Finding this balance is something we discuss a great deal. We definitely don’t want students to get lost in detail, and for additional detail they can always reference their textbook. Dr. Klupiec: Because anatomy can become so incredibly detailed, the importance of why something is worth learning can often be lost. How would you compare EasyAnatomy’s Written Content, to that of traditional textbooks? Dr. Klupiec: Our written content is faithful to that of traditional textbooks, but more condensed, picking the eyes out of the salient information. Dr. Clark: In EasyAnatomy we include clinical applications, and that is not always included in traditional textbooks. We also include some palpation, which is not going to be in all textbooks either. Dr. Dawson: The visual organization of EasyAnatomy means that finding structures is intuitive. Within each body system the written content is organized in the same way, helping users to understand similarities and differences between structures. Dr. Clark: With each written description we’ve tried to answer the question: why is this structure present? We’re also including function, which is a differentiator to a lot of anatomy textbooks. One of the buzz phrases in anatomy is “don’t just teach structure, teach function too”. Are there any additional aspects of EasyAnatomy’s Written Content that you find particularly interesting? Dr. Clark: With traditional textbooks such as Miller’s, the goal is to present all the information (that is where I go when I have questions). When a student reads Miller’s they might want to go jump off a bridge, it’s so dense. We’re aiming to create something more relevant and friendly to students. Dr. Klupiec: I believe professors will find it helpful to have the clinical applications included in EasyAnatomy’s written content. The prof can always add to it based on their own experiences too, but having it in there is quite handy. Dr. Clark: We are striving for accuracy at all times. We are very aware of the importance of accuracy and are doing all we can to achieve it. Professors won’t recommend something that is filled with errors. 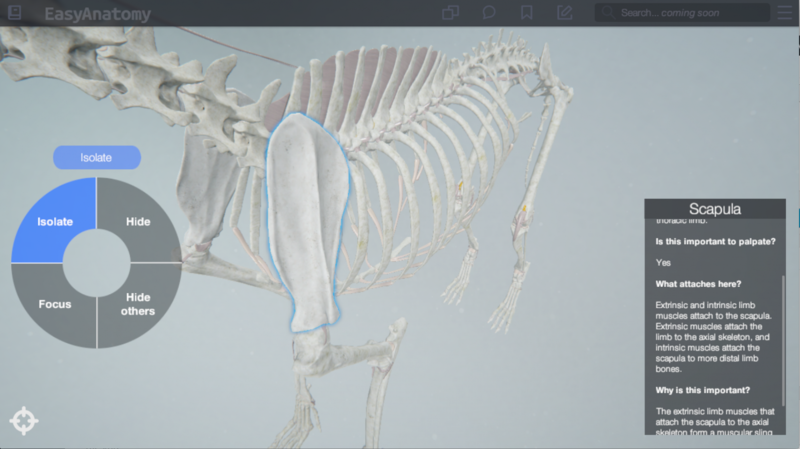 Dr. Klupiec: EasyAnatomy’s written content is like combining a traditional textbook like Miller’s, with an applied textbook like Kumar’s – it’s a nice blend of fundamental and applied anatomy.